DuraTech Industries customizes decorative and functional labels, or decals for industries such as automotive, industrial, medical, appliance, computer and electronics. With our team’s industry knowledge, and continuous development of label design and technology, we will utilize the best and most cost effective printing method and materials for your application, including label constructions that can meet UL and CSA requirements. Whether you provide us a logo, or rough draft art work, knowing the specifics of how your label will be used is critical; as is the look and feel you are trying to achieve. Doming: Creates a glossy, domed, bubbled, 3D or lens effect that enhances clarity and color. Embossing: Creates an image that is raised above the normal level of the material. In-Mold Decorating (IMD): Graphics are permanently embedded. Metalphoto™: Photosensitive anodized aluminum with a 20 year-durability guarantee. Etch and Fill Name Plates: Chemically etched into metal substrate; endures harsh environments. Metal Name Plates: Made with aluminum in various thicknesses. Graphic Overlays: Is a decorative user interface that informs or adds functionality to the product. If your label application process or bill of materials involves multiple labels, consider using our Sets and Kits to save on tooling costs and reduce production. Or, reduce lead time with forecasting through our Supplier Managed Inventory Program. 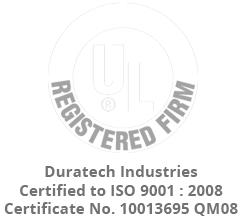 DuraTech Industries can review your label requirements and offer cost savings options by running your parts as a set or kit – saving on tooling costs and lowering unit prices per label. Set – A group of parts ordered together and produced on the same material and generally used on the same piece of equipment. Sets are typically supplied on a sheet and shipped under one set part number. Kit—A group of parts and/or sets, not necessarily printed on the same material, produced together. Kits are typically packaged together and shipped under one kit part number. For labels that are used on the same piece of equipment, ordering them as a set or kit offers several advantages. By combining like parts (same material and adhesive) together and running them through production on a common sheet, we can reduce production and tooling costs.